Well, hello there, Kidderminster Harriers. Let's talk about you. Kidderminster Harriers are a name you've heard of. It's probably not because Robert Plant is a fan or that in 1995 they lost 2-1 to Nuneaton in a game ruled by three female officials for the first time. It's not even because they had a physio named Conway – more about that later. It's probably because of the FA Cup and a wooden main stand. In the 1951-52 season they hosted the first ever floodlit FA Cup games. In 1993-94 they reached the fifth round. They beat Birmingham at St Andrews and Preston at Aggborough along the way before losing to West Ham at home 1-0. That's still a record for a non-League club. In that same season they won the Conference title. Champagne time – you'd think. They squeezed 8,000 into Aggborough when they played West Ham in that fifth round game. To do that they had to hold off on planned ground developments. They still replaced their old wooden main stand in time for the new season (haven't we got one of those? Gulp), but that delay cost them promotion to the Football League, the League having set a deadline of 31 December for the improvements. The buggers. I like this club. They seem pleasant. That doesn't sound like a compliment but it is. I've written a few of these Rough Guides and I always go on to forums and ask for fans' opinions on the team I'm covering. Usually I get a reasonable response mixed in with fish jokes and the occasional bout of outright hostility. Not from Harriers fans. From them, a uniformly positive response – and I feel like that's a warm Conference welcome. The club was formed in 1887 and comprised an athletics club and a rugby team. It wasn't until 1896 that the egg was swapped for a sphere and the athletes, well, legged it, and association football became the Kidderminster staple. They rattled around the West Midlands and Southern Leagues until 1983 when they made it to the Conference. Heady heights at that time but there was more to come from the Aggborough outfit. Promotion to the Football League finally came in 2000. For two years they hung around the bar and flirted with the play-offs but never got beyond a couple of drinks as they finished 10th and 11th in 2002 and 2003 respectively. They lasted 'til 2005 when they dropped back down into the Conference. In the four years since, they found national exposure again as they played the 2006-07 FA Trophy final against Stevenage Borough – the first cup final to be played at the new Wembley. I certainly have – and wasn't it a pleasure? It was for the Mariners, at least. 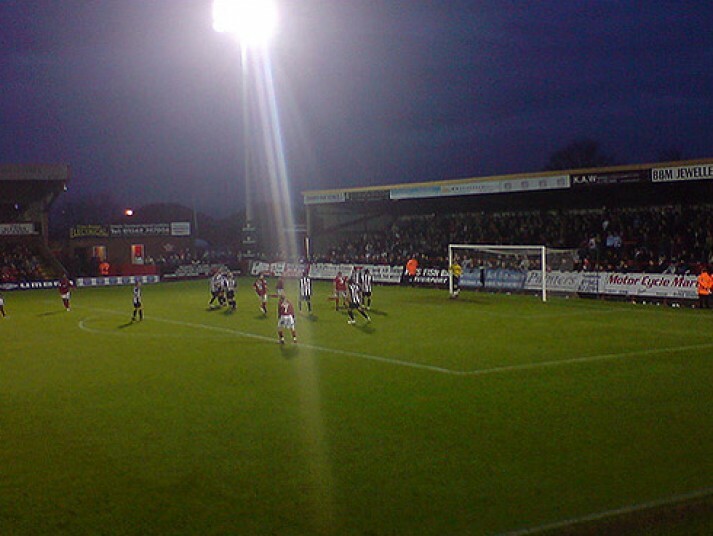 In 2004-05 we played our only league games against the Harriers, winning home and away 2-1 and 4-1 respectively. The home gameprovided an incident that will live with me and many other fans of both clubs for a long time. A physio named Conway went to an injured player lying prostrate in front of the Pontoon. The player's name was Diop. He was rolling in agony, howling his pain and receiving the traditional well wishes from the Pontoonites. Conway didn't seem to have much sympathy and his bedside manner was tested to breaking point and beyond. He left the player to his histrionics and walked away without a backward glance. The player howled his frustration beating the Blundell turf in a fit of pique. Laughter and catcalls and calls for him to leave the pitch reached what must have been painful levels as the referee ushered him behind the goal. Still we laughed and still no one came. Eventually he struggled to his feet, and gingerly planted the wounded leg. Wincing, he raised it back into the air and let it hover a few inches above the grass. And still no-one came. The game resumed. No one was watching the other 21 players. "Hop, hop, Diop! Hop, hop, Diop!" we sang as he took a few tentative uni-foot shuffles, reaching out uselessly at the goal's netting for support. And still no one came. He hopped almost to the corner flag. By the time he was halfway even the Town fans had stopped singing, falling into an embarrassed silence. Finally a steward put his arm around the player and helped him to the tunnel and out of sight. Soon afterwards, both player and physio were released by the club. Other links include a shared manager in Stuart Watkiss; Shaun Cunnington has also managed at Aggborough – he was caretaker when Diop hopped; and Terry Fleming seems to have a similar reputation west of Birmingham as he does on the east coast. What can we do when the sun goes down? A worrying sub-heading given our decade-long decline, so let's assume we're talking about Kidderminster nightlife and all the other things we could see and do when the football's not a kicking. A chippy has been recommended to a Grimbarian: although there's a suspicious lack of haddock in the name, Captain Cod on Comberton Hill must be worth a visit even if it's only because it sounds like a novel by W E Johns. As for pubs: some keep away fans out altogether but it depends on the away fans' reputation (that's us buggered then). Harriers fans are generally friendly, I'm told, so if you're allowed in then make yourself at home. The King and Castle is welcoming, serves real beer and is a bit of a shrine to the age of steam. And if it's steam that powers your engine, the Severn Valley Railway goes right past the ground. Genuine steam locomotives to pour soot and smoke over another Town performance, or a memento of a bygone age when we weren't so crap? Only time will tell. Last season the Harriers finished 13th with 57 points. I've heard a lot about a two-tier Conference: the top half is about the same standard as the fourth division, and the bottom, well, isn't. Given Kidderminster's recent history it seems harsh to label them the worst of the first or the best of the rest. But I feel like I have to. They've only threatened the play-offs once since their return to this division, finishing sixth in '08-09. Other than that it's anything from 10th to 15th. This year they were around 10th place and in with a shout until a poor run in March effectively ended their season. Aggborough is a very neat and tidy ground: four stands, mostly new, holding six and a half thousand people. The two end stands are both terracing and not a post in sight for the side stands. The food has a national reputation that is well-earned. Lovely. "Hey, you're Kidderminster. You've been to Wembley four times!" "Hey, you're Kidderminster. You've been to Wembley four times! And you've never won." Do you know the Kidderminster area? We want your recommendations for local pubs, cafés or B&Bs, to feature in our pre-match factfiles during next season. Use the Cod Almighty feedback form to send them in – or to share any other thoughts you might have about our Rough Guide to the Conference.